For those in a hurry, we offer a special selection of tables that are immediately available. These E2 series classics are with you in one to three days. Design your E2 table, save, and send your draft to your email. Finalize it whenever you want. 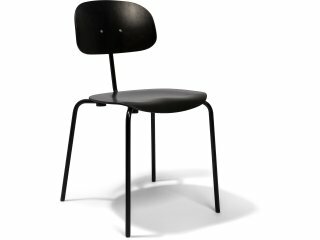 Over time, the E2 has become the standard table for architects, artists, and designers. A simple, but well thought-out steel pipe construction with a table top that pretty much sits loose, a stable and long-lasting work table hen as well as now. With matching accessories, cable and PCs can be mounted with ease, the table height variable changed, or a drawing table created with an angled table top. The E2 design comes from Adam Wieland and is derived from the original design by Egon Eiermann in 1953. The timeless steel pipe construction with a distinctive cross strut is a rugged lightweight. Quick assembly and disassembly. 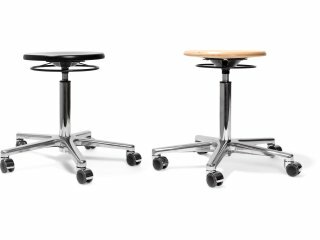 With the height adjusters, the E2 table adjusts very easily to a perfect seating or even standing height. E2 with a diagonal table top? Using the height adjusters, you can transform the E2 into a drawing table. The table frame of the E2 series is made of 21.3 mm thick steel pipes. An E2 table frame consists of two side sections and the characteristic cross strut common in this series. Both are screwed together at only four points. Therefore, the table can be put together and taken apart quickly, as well as stored easily. The functional and well thought-out design of the steel pipes ensures stability and, at the same time, a very lightweight table. 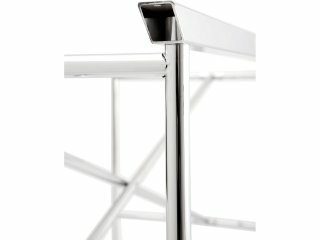 With the exception of the galvanized and chrome versions, the steel pipe frame is powder-coated. The chrome-plated frame is more expensive to make because the steel pipes are immersed in an electrolytic bath during galvanic processing. 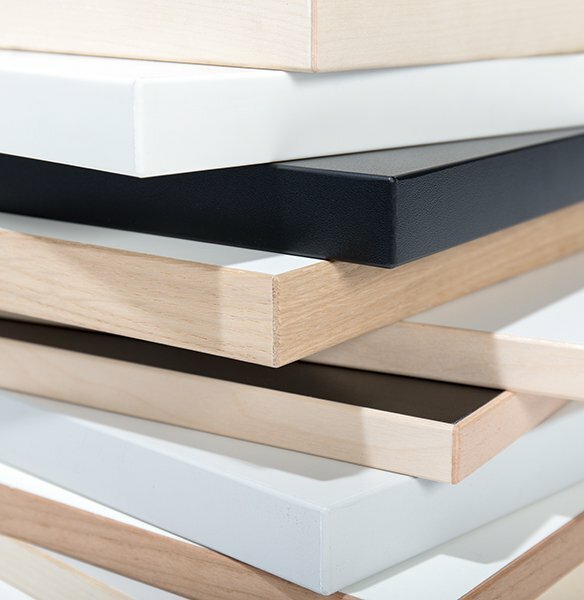 The table frame of the E2 series can be combined with a high-quality, natural linoleum or solid melamine table top. If you choose a linoleum table op, you have, among other things, the choice between a straight or tapered edge, as well as rounded corners. There are no limits to the number of configurations, and you can create charming E2 tables, for example, from a table top with a natural real wood edge and raw-looking, colorless E2 table frame design. To ensure thinner tops don't begin to droop when longer than about 150 cm, we recommend using table top supporter designed for this purpose. 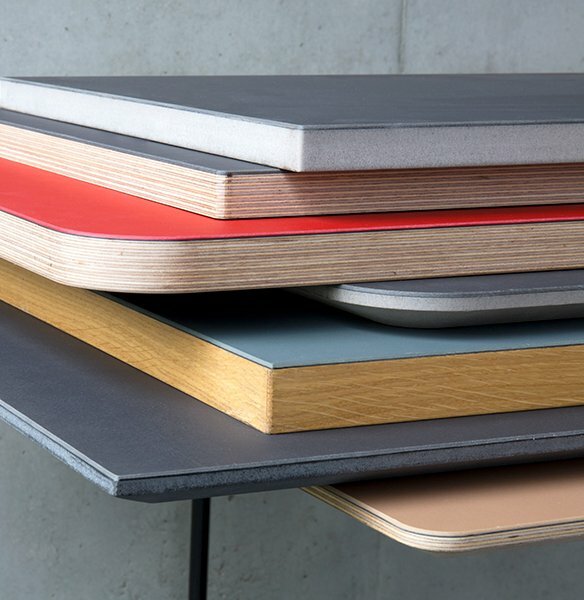 This applies, in particular, to our thin melamine table top, the thin linoleum tabletop with a multiplex birch core, and the linoleum tabletop with an MDF core. The steel pipe construction of the table tops for the E2 table can reliably support a weight of about 50 kg. Generally, is the table top is loosely fitted using the push plugs at the end of the side sections. If you want to make sure the table top on the frame, you can use what is called a top support. The E2 table can also be used as a conference or dining table. What makes this possible is the positioning of the prominent cross strut. If you're looking for a group table for meetings or the breakroom, we recommend a centrally positioned cross strut. 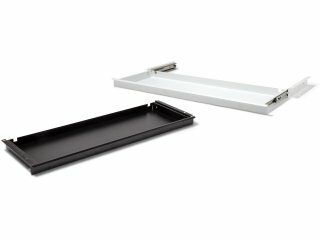 In the classical use of the E2 from one side - i.e., a work top or desk - we recommend a cross strut that is positioned closer to one side. This provides more legroom. Good to know: The position of the cross strut cannot be changed. Each side section is the only part with holes for one of the two positions. We offer the E2 table in two heights (approx. 69 cm and 75 cm). The standard frame height is 66 cm or 72 cm. 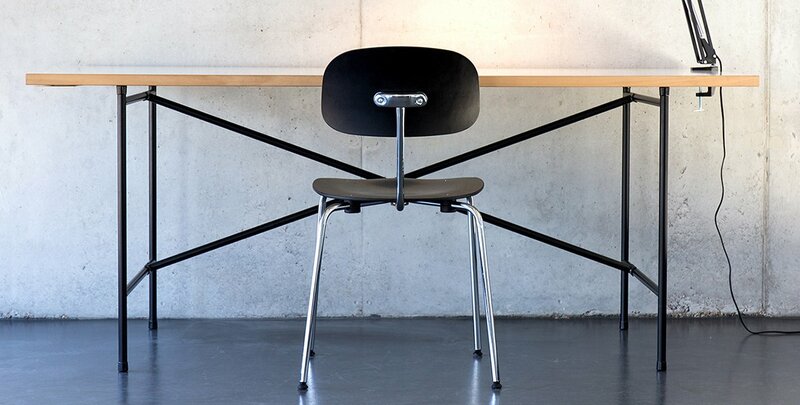 The low original frame height stems from a time when the E2 was used as a drawing table with an angled table top. The height allows you to reach the rear section of the table top better. 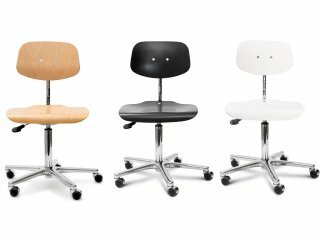 It's also suitable for smaller people and an ergonomic seating posture. 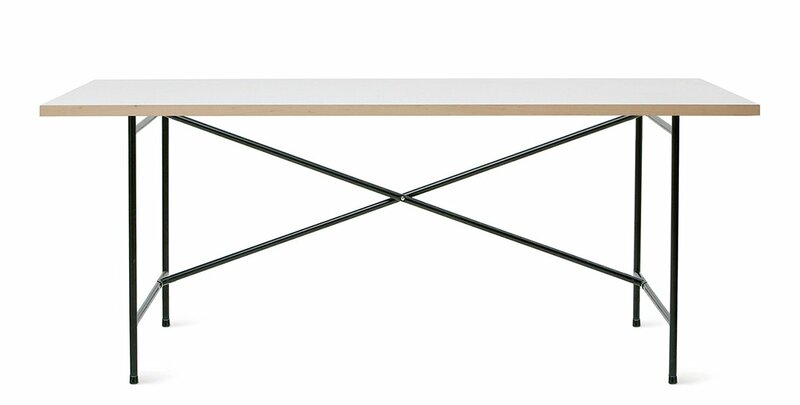 Here's how it works: Create an E2 table with an angled table top. 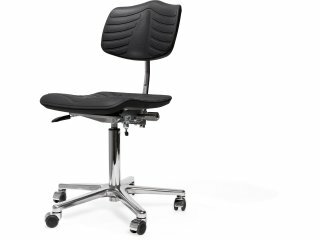 With height adjusters, you can not only have tapering but also straight, ergonomic tables. Depending on the body size, choose the appropriate starting level for your purpose, and let it grow to the appropriate height growth with long or short height adjusters (simply add in the configurator). 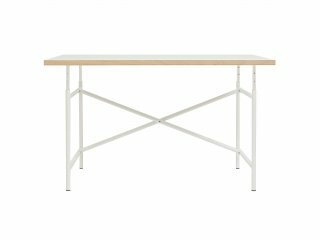 Large work desks or tables with a height of approx. 98 cm can be built with the initial height of 75 cm and long height adjusters. A table that grows with kids. The E2 series offers a practical table for children and young adults, using height adjusters to adjust the size of the body. 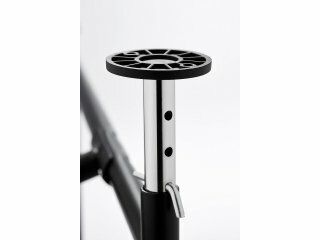 Starting at 55 cm, the height adjusters the table frame to a height of up to 72 cm. A peek under the table top: How big is the E2 table base frame? 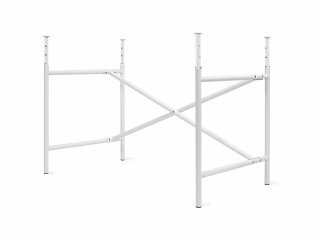 Regardless of the table height, we offer the cross strut of the E2 table frame in two lengths and the side sections in three lengths. If you decide on a table top with a length up to and including 149 cm, the matching table frame has a length of 100 cm. In the case of a table top length between 150 cm and 240 cm, the table frame is 135 cm long. Depending on the specific length of the table top, the distance between the frame and the edge will vary. The choice of table top width is reflected in the size of the side sections of the frame. If you decide on a table top with a width up to and including 79 cm, the matching sides are 60 cm long. In the case of a table top width between 80 cm and 89 cm, the side sections have a length of 70 cm. Table tops with a width between 90 cm and 120 cm are combined with 78 cm sides. Also here – similar to the length of the table – is the distance between the frame and the edge sometimes more, sometimes less. If you have an E2 for an already existing table frame, the following information will help you configure the correct dimensions. In order to get the table frame with the desired dimensions, you can store a dimension in the configurator that corresponds to your preferred frame size. For example, if you want to order a 135 cm long and 70 cm wide table frame, select a measurement between 150 - 240 cm in length and 80 - 89 cm in width in the configurator. Then you'll only have to click "No" under "Top," and the E2 table frame is configured. If you want to build an E2 drawing table with a slanted table top, there are two possibilities. The first option is to place the front edge of your table top on the horizontal struts of the two side sections. This way, there is already a 2-degree inclination. The rear section of the table top lies loosely on height adjusters. They can be used to achieve an inclination of up to 19 degrees. If you do not want to place the table top on the sides of the table, but wish to fix it to the table frame, you will need mountings for angled tops. The two rear mountings are screwed to the table top and, at the same time, plugged into the two rear height adjusters (remove the plug beforehand). The front part of the table top can lie loosely on the side sections and/or height adjusters. Good to know: The inclined position with fixation can only be used with inclined table top mountings. 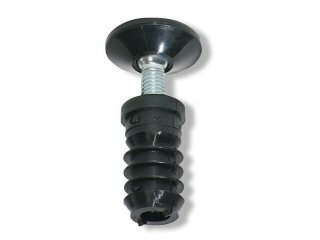 It is not possible to screw the table top with reinforcing top holders, because they do not adapt to the angles. * Valid for shipping within Germany. Learn more about our delivery conditions.